Bahrain national carrier Gulf Air has an excellent reputation across its global operations for on-time performance (OTP), which is of critical importance to the airline’s passengers, said a senior minister. Zayed R. Al Zayani, the Minister of Industry and Commerce and Chairman of Gulf Air’s Board of Directors, was speaking in light of Gulf Air being recently awarded for its OTP across the UAE. The national carrier won top recognition from Dubai Airports for its 2017 OTP category A (2000+ movements) at the second annual Airline Excellence Awards held iin Dubai this year. Alongside this, Gulf Air was also recognised by Abu Dhabi International Airport for its OTP throughout May, during which the airline achieved 94 per cent OTP and exceeded the target set (All Abu Dhabi International Airport departure flights have to attain 80 per cent OTP). On the top honour, Al Zayani said: "These OTP awards in both Dubai and Abu Dhabi are valuable recognition for all the efforts exerted by Gulf Air staff working together to help the airline’s flights operate on time." "With 8 daily flights to Dubai and 4 daily flights to Abu Dhabi, Gulf Air’s Dubai Airport Manager Ahmed Hafiz and Abu Dhabi Airport Manager Tariq AlAlawi work tirelessly to ensure that the airline’s promise of seamless movement to and from Bahrain and across Gulf Air’s global network, is delivered," he stated. "This is but a small example of what this airline is made off, our dedicated and loyal staff are the backbone of our airline. I would like to thank all Gulf Air staff who contribute to such achievements and especially to Hafiz and Alalawi and their teams on this occasion," observed Al Zayani. 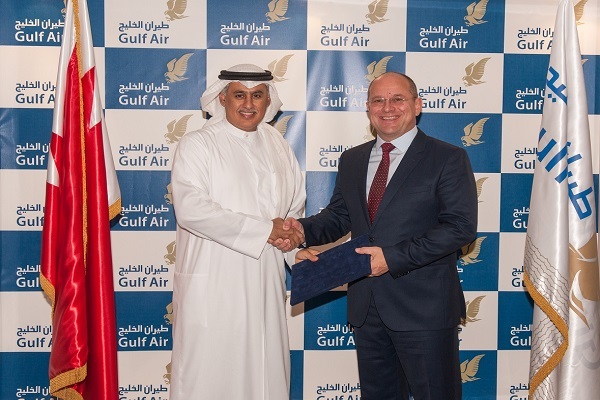 "Gulf Air has an excellent reputation across our global operations for on time performance, which is of critical importance to the airline’s passengers. I am delighted with this achievement and look forward to seeing Gulf Air continue to excel in its operations across the globe," he added. Gulf Air said it has held the top spot in recent years for OTP. The kingdom's flag carrier was independently ranked by UK aviation analysts OAG as the third most punctual airline in 2017, amongst Middle East and African airlines, with an average OTP of 80.22 per cent.